Well, the start to day 2 wasn’t too great – my laptop’s WiFi broke at the wrong time! I guess there’s never a right time to have a broken adapter but it’s time to buy another one! Anyway, managed to get the already delayed blog post about the previous two days out that I hope you’ve seen by now. Made it in time before the doors opened for the “General Session”. It started with a dance routine, complete with lasers as well (Eric Sloof posted it here). The keynotes followed after that. Having the major announcements already done at VMworld US, here it was more about the vRealize Suite and its components, betas and integration of products. Another major announcement was the availability of vCloud Air in Europe, with addition of a datacentre in Germany. Don’t know about others but for some reason, I had a sense of Déjà vu when sitting in the session. Could be just me! Also, the general session seemed to overrun a little bit. I only say that because I got dangerously close to missing my session. I thought the general session is supposed to finish before the sessions start but then I could be wrong. Anyway, even though it seemed a bit rude, I had to leave. 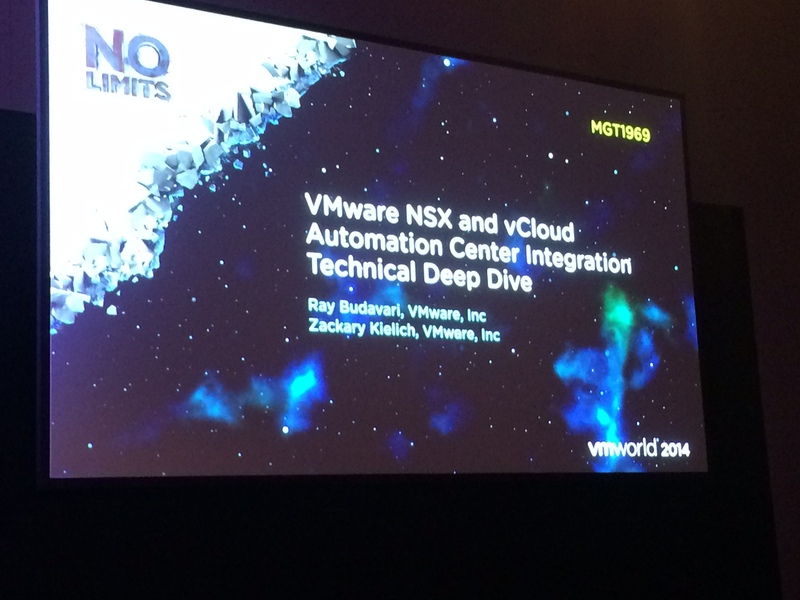 Very interesting session and if you’re interested in vRealize Automation and NSX integration, it’s an ideal one to attend to see what it can do now. Obviously, due to time limitations, it doesn’t go into too much depth but it’s good enough to get a good idea of its capabilities. Machines/networks also get deployed while the session is running so you do get to see the end result, proving it all actually works! On my way back towards the bloggers area, I passed through “Solutions Exchange” and met a few people. Couldn’t possibly miss the PernixData booth. Had a quick chat with Satyam Vaghani and picked up a hard copy of vSphere Design Pocketbook 2.0 Blog Edition. Extremely handy book with an excellent quality print, I must say! Next up was “Destination GiveBack” – A VMware Foundation initiative where you make and fly a paper aeroplane and depending on how far it goes, you get to win money for your chosen cause. This is a great initiative and if you’re attending VMworld, I would strongly encourage you to spare some time for it. I did and won 45 Euros for “Women and Girls”. There will be another chance today so I’ll definitely give it a go! Even though I booked a couple more sessions for today, I decided to give priority to meet people and have chats. That’s the part I enjoy the most about VMworld (in addition to attending tech talks) and that will remain my strategy for the remainder of the conference, with some sessions sprinkled in between. Needless to say, blogger’s area and Solutions Exchange is where I spent the rest of my day. In the evening, I could only manage the vExpert / VCDX / NSX VMworld Europe 2014 Party (other parties were also available :-)). Finding the venue definitely wasn’t a problem as it was at exactly the same place as PernixData’s party the night before. As usual, I had a great time having chats with fellow vExperts and VCDXs. Most people went on to attend parties organized by Veeam, Cisco and EMC and judging by the Twitter feed, they had a great time. These vendors generously arrange for and fund these gatherings which are a great way of relaxing after a hectic day at the conference – not to mention the networking opportunities. If you attend next year (either in San Francisco or here), make sure you save some energy for these events too as they’re great.